This place is on the list should you find yourself driving north on the A1 by the east coast, say, for a short break that might not take you further than Edinburgh. Instead of hurtling towards Scotland’s capital It’s worth diverting for an hour or two to head for St Abbs, perhaps via the small fishing port of Eyemouth - so you can grab a great coffee and a snack at Rialto’s. (Wait, wait, that belongs in another list of great coffee places.) Anyway, there’s easy parking in the town, on the promenade (called locally ‘the Bantry’). St Abb's Head, near the village of St Abbs, makes it on to our list of ten best places for wildlife because it's easy to reach and the seabird colonies are spectacular. So is the coastline. This picture looks back at St Abb's Head from the north-west. The white speck at the top of the picture is the tip of the lighthouse. St Abb’s Head, pictured here, looking from the north-west, is, basically, one of those 'seabird cities' of the kind that are usually visited much further north. Fowlsheugh near Stonehaven and Troup Head between Banff and Fraserburgh in Aberdeenshire offer similar experiences further north. And that’s even before you reach the great seabird cities of the Northern Isles. More on St Abbs on that link. Muir is ‘moor’ of course and these two nature reserves are on either side of the famous valley of the River Dee that runs west from Aberdeen - though Banchory, Ballater, Aboyne or Braemar would make much better bases than the city to discover these often drier eastern parts of the Grampian mountain massif. Both these reserves give a good introduction to the moorland and the heathery and birch habitat that is quintessentially northern. The pinewoods of Glen Tanar give way to the high plateau lands of the Grampians - and it’s altogether a wild and pleasing prospect, with red squirrel, crossbill and possibly capercaillie to encounter. Morrone Birkwood, above Braemar is also worth a look. Strictly speaking, of course, this isn't actually a picture of the Loch of Strathbeg. It lies beyond the dunes. This is the long beach that runs south of St Combs towards and beyond Rattray Head and down to the town of Peterhead. North of Aberdeen in north-east Scotland this wild and austere coastline would make it into the ‘off-the-beaten-track’ listing as well. Best time to visit is autumn and winter for the spectacle of thousands of grey geese. The loch is an internationally important wintering ground and ‘bird motorway service area’. Stay at the Tufted Duck Hotel at St Combs. (No, wait, that belongs in the ‘Where to hear the most genuine local accents’ list.) Wild seascapes, hoary and ancient dune-systems nearby - a bit of an acquired taste perhaps - but certainly a ‘different’ Scotland. Loch Leven north of Edinburgh, off the A90, offers a similar but slightly tamer winter wildfowl experience. Montrose Basin in Angus is also very good. This top ten for places to see wildlife is taking us to some of Scotland’s out-of-the-way places. This is a reserve at the top of mainland Scotland for serious birders and also folk who like big skies and silence. Breeding waders in spring and summers, plus raptors such as hen harrier, merlin and short eared owl. Long horizons and distant hills are the backdrop to these wide-open peatlands. Worth a diversion if, say, doing a Scottish north coast tour or en route for Orkney. Beinn Eighe from Loch Clair. The Glen Torridon road runs along the base of the mountain, east/west beyond the loch. Follow nature trails on the Loch Maree side or try the adventurous climb up and into Coire Mhic Fhearchair (‘the corrie of Farquhar’s son) to see the mighty triple buttresses of Beinn Eighe. Wait though - we’re supposed to be talking wildlife here. Oh yes, maybe a golden eagle, red deer for sure and pine martens too on the lower wooded slopes. And lots of hungry midges. The national nature reserve here joins with the National Trust for Scotland’s Liathach, Beinn Eighe’s equally impressive neighbour. Accommodation choice is wider at Shieldaig, to the west. No surprises that the further you get away to the edge of Scotland, the better it gets for wildlife. (South Uist is the only place where I ever saw a short-eared owl fly through a crofthouse washing hanging on the clothes-line.) The national nature reserve of Loch Druidibeg in South Uist (Outer Hebrides) is well worth exploring - machair (shell-sand coastal pasture) in the west, more rugged ground and the loch itself to the east. Great for breeding waders and raptors, with a good chance of seeing otters as well - drive the road east (actually out of the reserve) to the road-end at Loch Skipport and take a walk. Denizen of the oakwoods of Inversnaid, by the shores of Loch Lomond (I love 'denizen', don't you?) A wild goat in early spring. Loch Lomond is a popular place but the oakwoods by Inversnaid remain comparatively unspoiled, in spite of the popular long-distance footpath, the West Highland Way, running through this RSPB reserve. Good for songbirds such as warblers - and pied flycatchers are also present. A higher level trail leads out on to the moorland, where black grouse - a bird with a somewhat patchy Highland distribution - can often be seen. While Caerlaverock Castle, with its unusual triangular design, is worth a look if you’re touring Galloway in south-west Scotland, the reserve at Caerlaverock is an autumn and winter must see. The Caerlaverock Wetland Centre offers deluxe viewing. Ospreys are a feature in summer (though, truth to tell, there are plenty of other places to see them in Scotland) while among the thousands of overwintering wildfowl, barnacle geese are a speciality of the area. Combine with a visit to the Wood of Cree (RSPB), an altogether gentler place - but go in late spring when the warblers and small birds are singing their beaks off in the beautiful woodlands by the river. In Strontian Glen in deepest Argyll there is a fragment of Atlantic oakwood - just a hint of the great wildwood that once stretched across great swathes of Europe (not just Scotland). A deep green mossy, ferny place with a unique ambience and a reminder that this part of Scotland with its soft western air has an especially, uhmm, damp and mild climate. Combine with, say, a trip out to Ardnamurchan Point where you can take a boat trip to see (hopefully) whales, dolphins, porpoise and basking sharks. 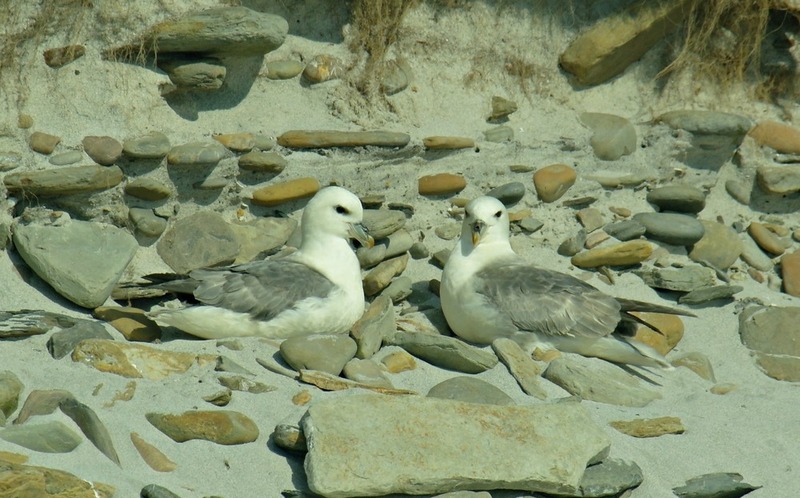 Normally, these fulmars would nest on cliffs. However, on North Ronaldsay, in keeping with the mildly eccentric air of the place, they nest on the sand. ( Never seen that anywhere else in Scotland.) When there is no wind, they sometimes fail to gain airspeed for take-off. Hence the local sport of 'tossing the fulmar' to help get them airborne. Read more on the North Ronaldsay page. Number ten here has to be a roundup. It is so hard to choose a top ten under this wildlife category in particular - for example, lots of places on Shetland should be on the list - Sumburgh Head for puffins, the spectacular island of Noss (summer boat trips), Hermaness for those amazing views of the very end of Scotland (and more puffins). Then, again in the Northern Isles, Orkney’s North Ronaldsay has a reputation for spectacular rarities making a landfall (ditto its northern neighbour Fair Isle). Some types of wildlife are associated specifically with certain areas: the Moray Firth for dolphins, the Bass Rock for gannets, Mull for sea eagles, Loch Garten on Speyside (and the rest of the River Spey) for ospreys are just a few examples. To finish on the observation that prefaces this list: Scotland is a ‘wildlifey’ sort of place and a great view of, well, something, can pop up anywhere in Scotland’s countryside. Just keep watching - and keep the camera handy. Return to the main Outdoor Scotland - Top Tens list.